11. Gathering at Hunt’s Barn. 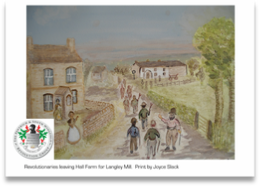 This artist's impression represents the village of South Wingfield. 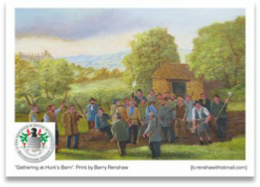 The Pentrich revolutionaries started their march on the 9th June 1817 from Hunts Barn, which was situated on the north side of Garner Lane, South Wingfield. Around fifty men left Garner Lane by 10pm, setting off through Wingfield Park, seeking arms and more men. They eventually split into two groups, to cover the scattered houses more quickly, meeting back up at Pentrich Lane End. One group was led by Jeremiah Brandreth, Isaac Ludlam and William Turner, while the other group was lead by George Weightman and Edward Turner. various books and painting magazines. During this time he also became involved in his second love, music and singing,which resulted with work all over the UK. Zealand and America. 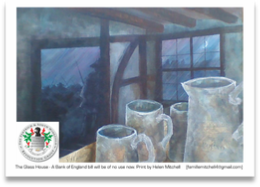 He became the owner and artist in residence at the Horsefair Gallery, Alfreton and claims to be the luckiest man in South Wingfield due to his good fortune being able to forge a career from his love of painting, music and singing. This picture represents the men of Alfreton starting to rise, readying themselves for the long march to Nottingham and then onwards to London. 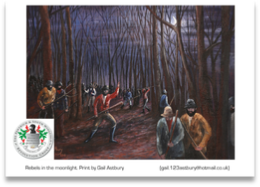 The men from Alfreton met in the Queens Head, which was owned by the Peach brothers, John and William, who both took part in the revolution. Another Alfreton resident who took part was German Buxton. German, a former collier, was later transported to Australia for life for his part in the revolution. German would marry in Australia, although he had a daughter by his first wife Elizabeth Henshaw. His second wife Esther Shimell would bear him no children. German died in 1835. 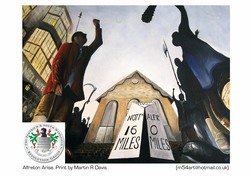 Martin Davis is an ex-firefighter turned artist who has worked freelance since leaving the Service in 2007. He is a versatile, instinctive artist who works in a traditional way but produces contemporary images inspired by light & form from his home studio in Swanwick, UK. He has sold artwork to private collectors around the world and secured coveted gallery space in local Derbyshire and Nottinghamshire galleries. 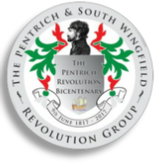 Living in the area that was the birthplace of the industrial revolution and which provided the backdrop to the uprising of 1817 Martin was attracted to the Pentrich & South Wingfield Revolution Group project by the idea of using an historical motif as his inspiration. 15. 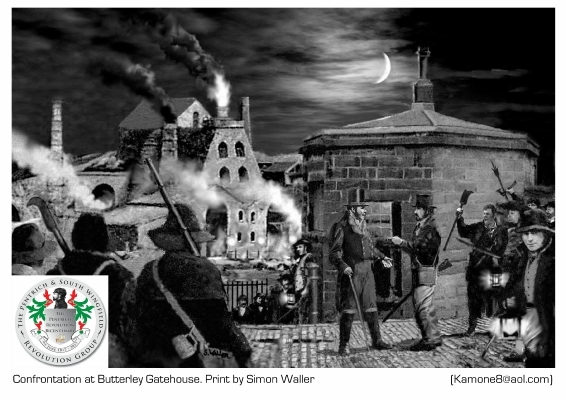 Confrontation at Butterley Gatehouse. 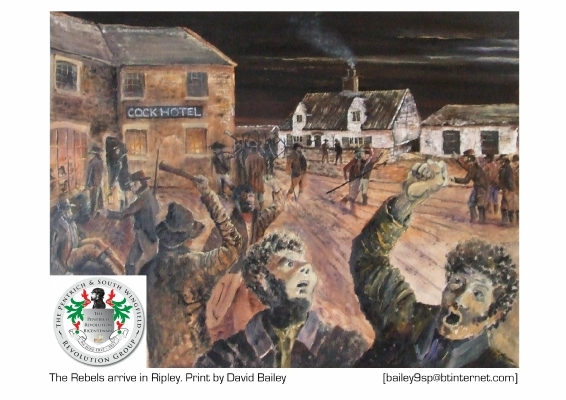 This artist's impression represents the hamlet of Butterley. 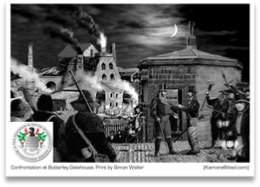 As the revolutionaries arrived at Butterley they were confronted by the manager of the iron works, George Goodwin, and his special constables. 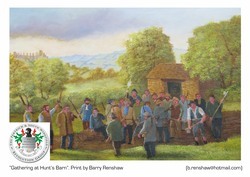 This picture shows the revolutionaries confronting Goodwin at the Butterley Gatehouse where they demanded arms and men. George Goodwin stood his ground and the Revolutionaries went away empty handed. After they had gone, Goodwin sent messengers to Alfreton and Derby warning them of the uprising. I grew up around Somercotes during the last part of the mining industry era derelict buildings were adventure playgrounds and plenty of fields to go wild in. I had no formal art training but had the luxury of stacks of paper to draw on as my dad was a printer and salesmen always gave him free samples of the latest pens and materials. My earlier drawings were mostly dinosaurs, and later got around to building a few – one of which still remains at the Cromford Plant Nursery site, at the side of the canal. From sci fi illustrations I went on to recreating past industrial subjects in oil and acrylics, and more recently photomontages to attempt to produce photographic images of subjects at a time before photography was invented. Along the route of the march, the men continued to knock at houses demanding weapons and men were pressed into joining the marchers. At George Turner’s house, his sons William and Robert, along with cousin Charles Walters, were taken and forced to join the uprising. The three cousins all dressed and slipped out of the back to hide, but the marchers found them and threatened to shoot them. Charles Walters was said at this stage to be crying. Charles Walters namesake and cousin, was – later in the day shot by accident, a gun held by another pressed marcher James Hill went off accidentally, and Charles was shot in the thigh at Langley Mill. I was born and live in Ripley and liked drawing and painting from a very young age. My big claim to fame in the art world was winning 365 ice-creams in a school competition run by the Co-op Dairy. when I won - you can never have too much ice-cream! 17. The Rebels arrive in Ripley. a thatched cottage in those days. Charles Booth was the last remaining survivor of the revolution and lived to be almost 100. He is on the censuses as living at 26 Chapel Street, Ripley. 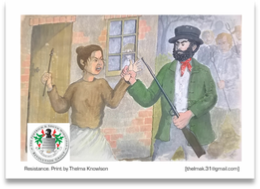 Charles gives a fascinating depiction of his view of what happened in the book Pentrich Revolution by John Neal, being republished by our group for the bicentenary. After early retirement there was an opportunity to spend a little more time on this subject, which has increased quite a lot in the last 5 years. Artists Society and a regular member of the Matlock Portrait Group - being part of these groups has helped me improve and enjoy art even more. A great group of people.I do work and experiment with many different mediums, Oil Paints, water mixable Oil, Inks, Acrylics, Water Colour and varying topics. 18. The Glass House - A Bank of England bill will be of no use now. 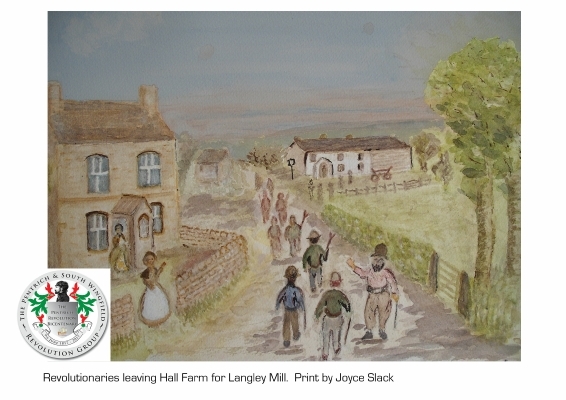 This painting shows the village of Codnor. public houses to take refreshment. In the Glass House, Jeremiah Brandreth refused to pay for the beer the men had drunk, saying "A Bank of England bill will be of no use now". The revolutionaries also called at the New Inn and the French Horn. During the 1970’s I studied Fashion and Textiles at Manchester Polytechnic, specialising in embroidery this was followed by thirty six years teaching art in secondary schools. Having recently retired from teaching I now have the opportunity to start practicing what I have been teaching. I work mainly in acrylic paint often applying different papers and materials to the canvas to enrich the surface texture. Some of my pictures incorporate areas of needle felting enhanced with hand and machine embroidery, some incorporate digital images within the painted areas and some contain sections of text relating to the subject matter. I spent four years driving through Pentrich on my way to work and knew something of the events of 1817. The chance to create this painting gave me the opportunity to find out more. 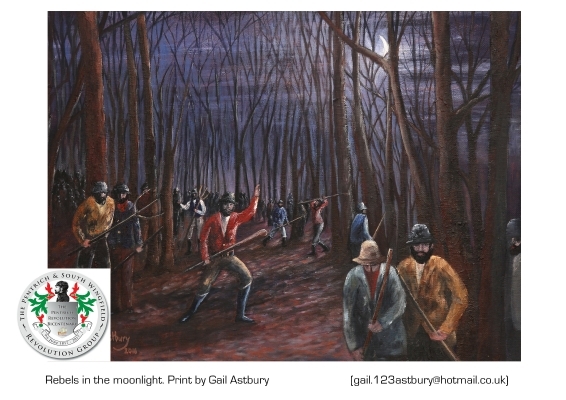 I was asked to create a piece showing the men reaching Codnor where they visited three pubs. 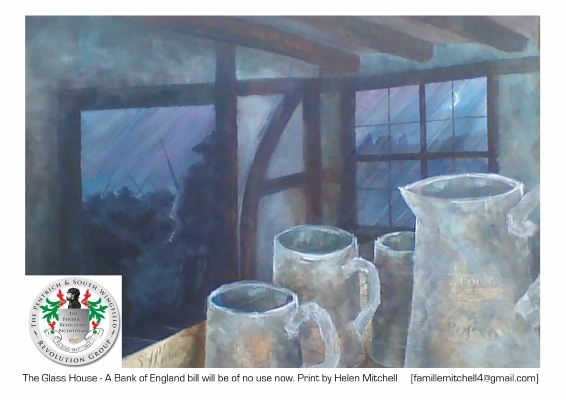 At the Glass House Jeremiah Brandreth refused to pay for the beer the men had drunk saying ‘a Bank of England Bill will be of no use now’ I have taken this as my inspiration and have incorporated images of bank notes of the time under the painting in the foreground of the painting. 19. 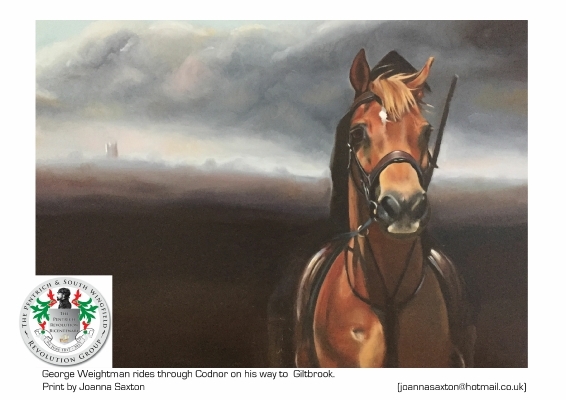 George Weightman rides through Codnor on his way to Giltbook. George Weightman rode off towards Nottingham from Pentrich Lane End on a pony ‘borrowed’ from William Booth. He reappeared at Langley Bridge between Nuttall and Two Mile House. The message having been given, the men continued towards Nottingham into the well-laid trap at Giltbrook. No-one knows why this message was given as the town was not taken and the soldiers had known about the march days in advance and were waiting, Governmental interference even going as far as to set the date themselves for the march. punishment resulting in him being sent to Australia for life. Described as a "prisoner of conscience" he lived there until he died in 1865. 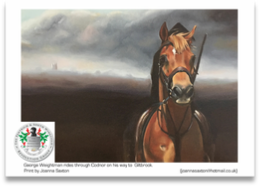 This painting depicts George riding through the fields on his way to Giltbrook, where you can just make out St Lawrence Church at Heanor on the horizon. Many thanks to my friend Sophie for allowing me to use her Welsh cob "Benji" as a model- I think he looks very brave. I have always loved painting and drawing & decided to return to full-time education in 2003 to study Art & Design. In 2006 I won "Equestrian Life's" artist competition and in 2007 I graduated from Nottingham Trent University with a first class degree in Decorative Arts. I now work as a Marketing Manager but still paint regularly in my free time. You can see more of my work at joannasaxton.com or on my Facebook page Joanna Saxton Fine Art. 14. Rebels in the moonlight . This artist's impression represents Swanwick. Charles Walters and George, James and William Weightman were identified as carrying the bullets. The men arriving into Codnor from Alfreton and Swanwick would have stopped in either the New Inn or the French Horn for a drink. I have been painting for over 30years, mainly in watercolour’s, until I discovered oil's about 5 years ago. Landscapes are my favourite subject, especially of Derbyshire and the Peak District. I have really enjoyed this challenge and I'm very interested in the Pentrich Revolution especially since I discovered that William Turner was my cousin five times removed. 12. 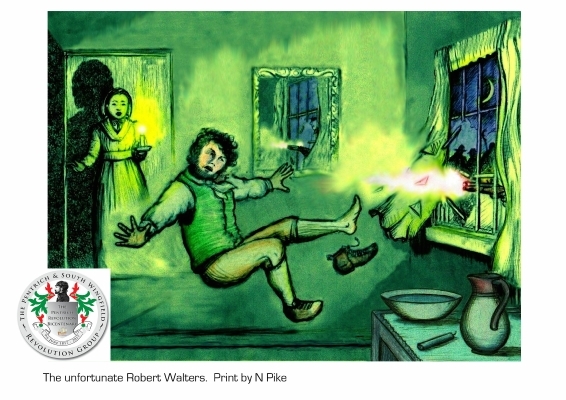 The Unfortunate Robert Walters . Jeremiah Brandreth’s group arrived at the home of a widow, Mary Hepworth, at just past midnight and it was here that the only fatality of the whole rising occurred. Mrs Hepworth bravely refused the men entry, so just past midnight, a window was broken and a shot was fired. Mrs Hepworth’s servant Robert Walters fell, hit in the shoulder as he went to tie his boots. Walters later died from his wounds. No one was ever tried for his murder, and no one ever knew if he was tying his laces to join them or not. 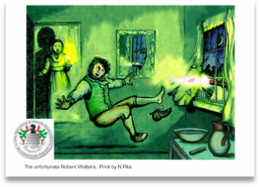 It has since been discovered that Robert Walters’ brother Enoch took part in the march and more recently, when the house of Robert Walters was sold, a number of pikes were discovered in the loft of the house. There were ten members of the Walters family in all who took part in the revolution – eleven if Robert is counted as one of their number. Working with any media which comes to hand, my aim is to capture a moment in time - ending up with a reasonably finished piece of art, without losing the character and movement of the original rough sketches . 20. Revolutionaries leaving Hall Farm. 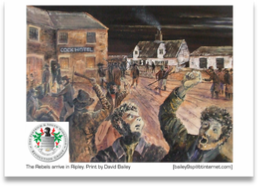 All along the route from Fritchley to Codnor, the Pentrich revolutionaries attacked houses that were known to have guns. These were mostly farmhouses. The first house they attacked belonged to Mr Hardwick, and arms were taken. Next was Henry Tomlinson’s house. Tomlinson had been warned what was happening and was waiting outside his house for the men. He watched as a group of about thirty walked up to his door and then made the excuse that his gun had gone off for repairs. 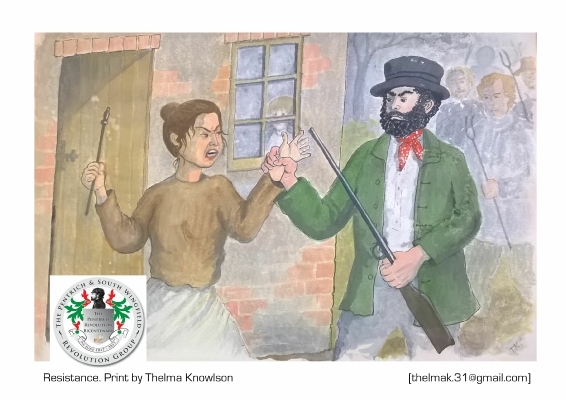 Other houses that were attacked were those belonging to Mary Hepworth, Mr Marriott, George Turner, Elijah Hall at Hartshay, Mary Cresswell at Greenwich and all the way to Hall Farm in Codnor. 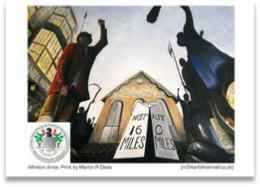 It’s good to be asked to take part in this historical event thus helping to tell the sad story as it evolved.